My new project begins with this circa 1970's wood shelf with plate groove that I purchased at a garage sale this summer. I think it may be a Home Interiors shelf. I gave it a couple of coats of Annie Sloan Chalk Paint in Old White. I love white ironstone dishes. I got a place setting for eight for $5 at a local thrift shop recently. The plates are Wm Adams and Sons Micratex. These three plates are salad plates. 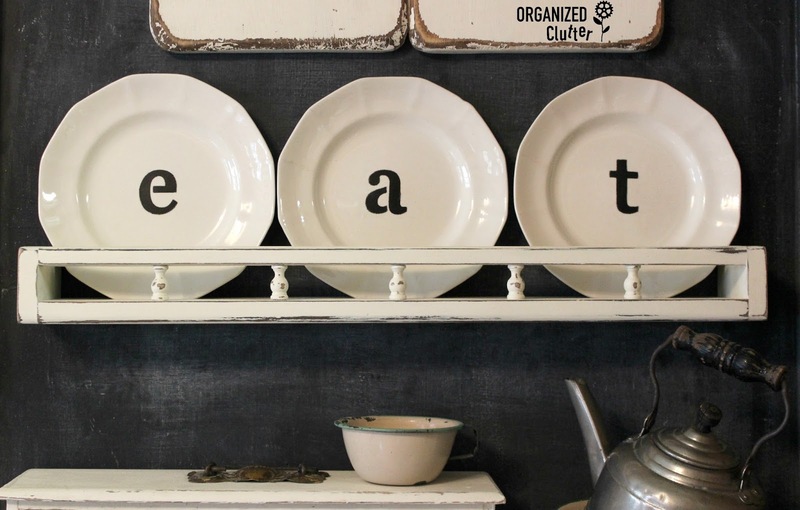 I am going to stencil letters on each plate so I measured and taped across my plates so my 2" letters would be centered and even. My stencils are from Kaisercraft. I used Ceramcoat Select Black Multisurface craft paint to stencil my letters on with a small craft roller. As you can see I distressed my shelf using 100 grit sandpaper and then waxed it. 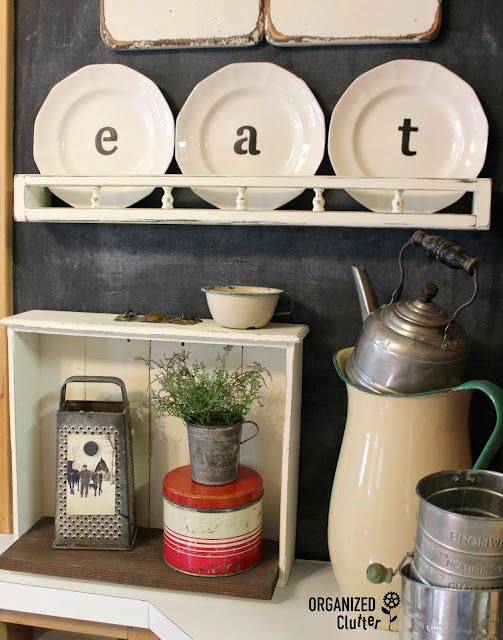 Next time I paint my kitchen I will not have a chalkboard wall but for now, the white shelf and plates look pretty good against it. I just hung this long old cutting board that I purchased back in April. I was pretty excited to find it for $28 at a local shop. 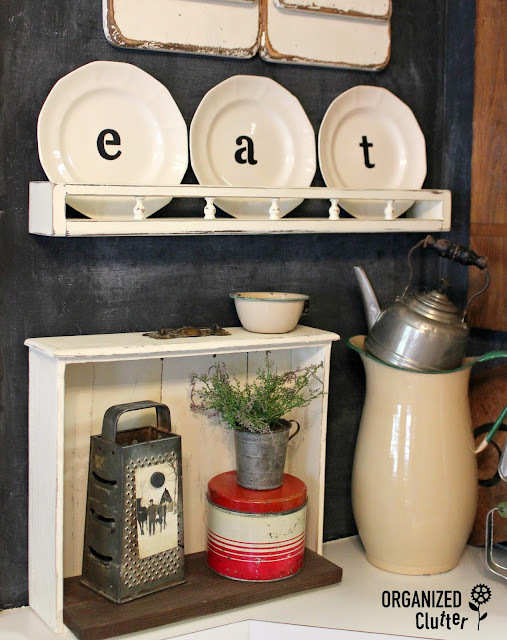 I think the plates and shelf fit in well with my other farmhouse decor! Carlene - Love that wall. Your shelf and plates turned out really cute. I love it, what a great makeover and the whole wall looks fabulous. Looks great Carlene. What a good deal on the dishes. I love the long cutting board!! 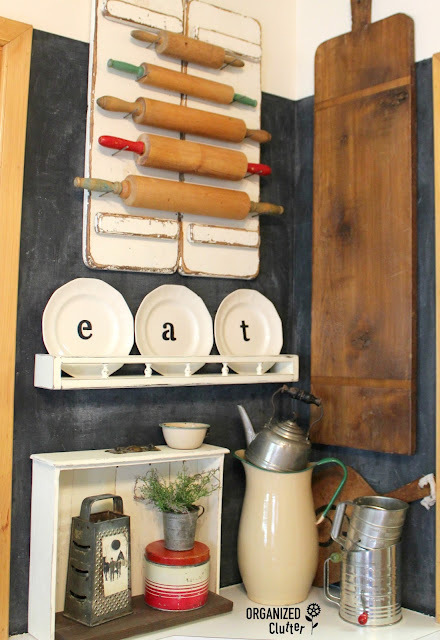 I would not have thought to draw a line on the plates with painter's tape before stenciling. They look great! P.S. I love your site! Love your makeover, love garage sale too! Really nice looking display Carlene. Love the long cutting board the best. I have several of the old wooden ironing boards with long one-piece boards that I can make into a long cutting board. Thanks for the inspiration. Nice DIY! I love what you got there! I like this one. you have some of the best ideas! Lovely display and the plates turned out gorgeous. Such an awesome idea. Another cute project.......those plates fit perfectly on your new shelf!